MCINTOSH, Susan Keech & Roderick J.. Prehistoric investigations in the region of Jenne, Mali: a study in the development of urbanism in the Sahel. Part i: Archaeological & historical background & the excavations at Jenne-jeno. Part ii: The regional survey and conclusions. Cambridge monographs in African archaeology 2. British archaeological reports International Series 89(i-ii). Oxford: B.A.R., 1980 Wrpps, 4to. In two volumes. (1). xi,280pp. 14 plates, numerous figures, maps and tables. (2). vi,289-541pp. figures, maps and tables, biblio. An excellent set in the publisher's stiff red wrappers. 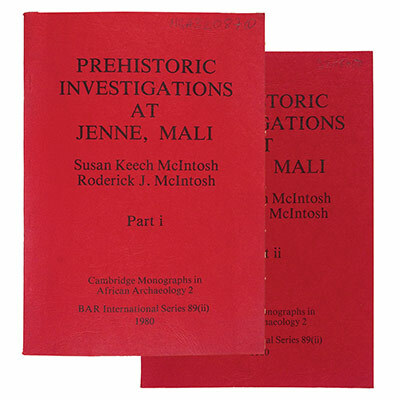 MCINTOSH, Susan Keech & Roderick J.. Prehistoric investigations in the region of Jenne, Mali: a study in the development of urbanism in the Sahel. Part i: Archaeological & historical background & the excavations at Jenne-jeno. Part ii: The regional survey and conclusions. Cambridge monographs in African archaeology 2. British archaeological reports International Series 89(i-ii). Oxford: B.A.R., 1980 Wrpps, 4to. In two volumes. (1). xi,280pp. 14 plates, numerous figures, maps and tables. (2). vi,289-541pp. figures, maps and tables, biblio. An excellent set in the publisher’s stiff red wrappers.